This is my welcome to the world of rice, often unknown and ignored. Rice is one of the most important natural foods in human nutrition around the world and is excellent for a complete, balanced diet. It has high levels of potassium and low levels of sodium so is highly suitable for people suffering from high blood pressure and kidney failure. The low lipid content and high amount of essential fatty acids make rice useful in the prevention of cardiovascular disease. It is easy to digest, needing 2 hours of gastric activity at the most, due to the typical small size of the starch granules. The glucose component of rice regulates intestinal flora. Brown rice has a high protein, vitamin and mineral content which aid intestinal motility because of the fibrous consistency. Rice is naturally gluten-free and can be eaten by coeliacs. Rice was produced on the land of Cascina Grampa hundreds of years before we settled there. I’m still producing rice preserving and passing on the traditional work cycle of the paddy fields which has shaped the people, landscape and history of our area for generations, season after season. We work respecting the rich heritage of rice tradition that continues to live in Cascina Grampa, with great enthusiasm for the land and water which have been a part of it for many, many years. The old hydraulic mill that has been brought back into operation with the millstone and rice husker, old wood and stone machinery that removes the chaff from the unmilled rice, are icons of our intention to create a rice culture based on its deep historical roots. This system was mechanised in 1500 with the rice husker, a wooden and stone machine actioned by a hydraulic driving force. In farms with a watercourse, mills with husking houses developed and these were the only systems for processing rice cultivated in Italy until the end of the 19th century. The rice processing companies only developed in the second half of the 19th century and have completely replaced the old rural husking houses since the Second World War. The modern industry has advanced systems but the principle of rice processing is still based on a mechanical impact on the grains, just like many years ago, although induced by different mechanisms. Today, my farm cultivates rice in land known for the extraordinary fertility of its rice fields for more than 500 years. In the 17th century, the husks of the rice harvested at Cascina Grampa was removed by the stone pestles of the milling area; later, until the 1950s, it was also blanched and polished with wood and stone propeller machines, all operated by the driving force of the water-wheel. Through the progressive renovation work to make this system operational once more, I can offer the experience of production of a now-forgotten world featuring the slow pace of the old machines for processing rice, abandoned with the advent of the food industry but worthy of being rediscovered and valorised because of the special quality of the product obtained. 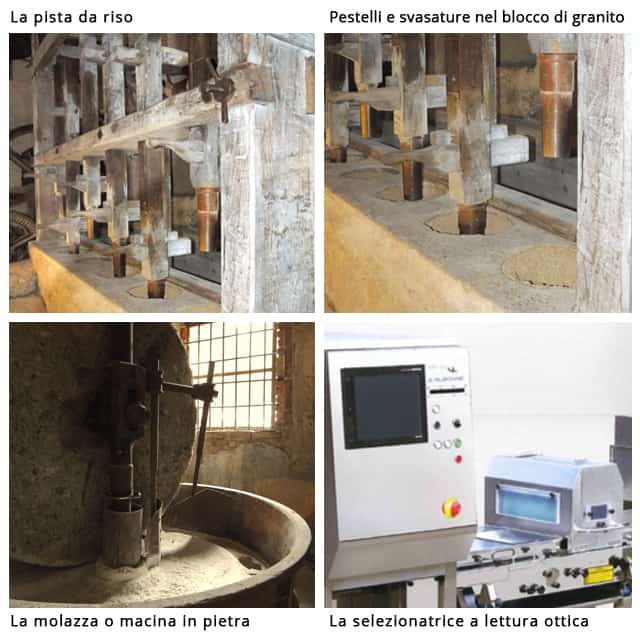 The results I can obtain now are better than in the past, due to the latest generation, sophisticated, electronic-controlled, technological selection systems which ensure perfect homogeneity and the complete absence of defects in our grains. Enter and discover the selection of rice produced by the Giovanni Testa farm – 3 types of rice, two reserves and one wholemeal. There is also a small production of special products, once more from rice, to taste and give as presents. Ecco qualche buona idea per godere delle caratteristiche organolettiche dei nostri risi. Provatele e fateci sapere come è andata; se vi fa piacere, condividete con noi le vostre ricette preferite.